This one is from all the way back in 2014 (I love New Year's jokes) when my lovely sister Lo was in town for Thanksgiving. In the post holiday fatness, we decided to get some "exercise" and wander one of Brooklyn's finest streets, the lovely 5th Avenue. 5th Avenue in Brooklyn, is much more akin to a small town main street than it is to the world famous 5th Ave in Manhattan. That 5th Avenue is dreadfully long, crowded with people who don't know what's up, and really doesn't have any stores you can't find in any American mall these days (malls are still a thing, yes?). It's cool and all, but 5th avenue in Brooklyn is filled with cool little shops, bars, and restaurants that you can't find anywhere, but BKNY. To help out with the post-turkey fatness, Lo and I decided to walk 5th ave and do some window shopping. I had one store in particular in mind: Annie's Blue Ribbon General Store. ...to Ryan Gosling coloring books. Annie's pretty much has anything your little heart could desire. Check out this MONKEY CLOCK! My little niece might be needing that sometime in the future, although right now she's not clear on the numbers concept, but soon come. Lo was so excited about all this smorgasbord of glory she made this face. And then she tried to talk me out of my anti-holiday card stance with these beauties. I rethought for a second, but held fast to my completely unfounded beliefs. Lo is working and in grad school so she is desperately in need of a new laptop case, we thought this one would be perfect. They also had some lovely holiday items. I realize this would have been more useful to you had I posted this before The Holidays, but c'est la vie. Check out this can of snow! AND CHRISTMAS CRACKERS!!!!!!! I brought some of these home from England one Christmas, but they were a bit lost of Americans. Apparently we need more than a paper crown and confetti for a good time (although, I'd be having a much better time if those things were always involved). 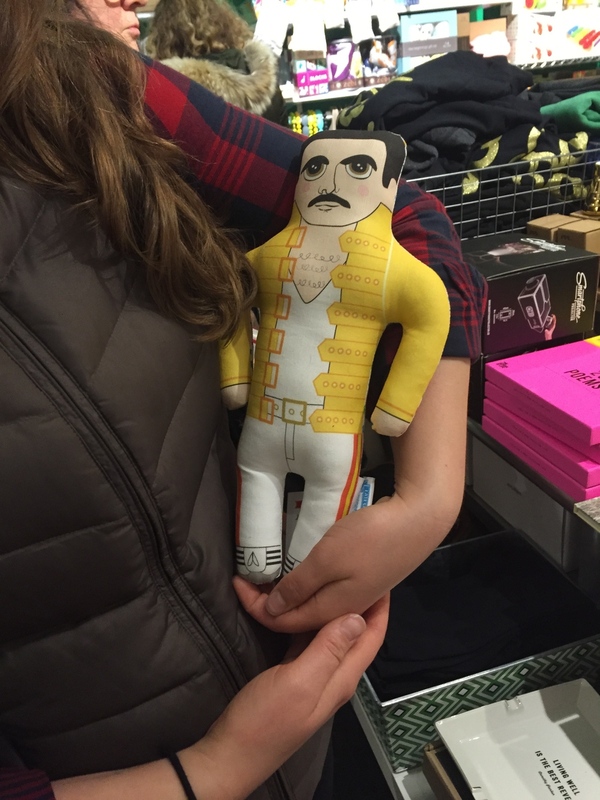 But my most favorite item in all the jumble and hubbub was this beauty. I've had a longstanding love of skulls. In high school I could be found wearing a shirt with tiny skulls on it or a black hoodie with a studded skull on it more often than not. My inner punk rock badass comes out in bursts. But I think this little beauty would make a nice addition to my bookshelf or my desk at work were it will remind people I don't suffer fools. But enough of my nonsense (although I supposes that's what this whole blog is). 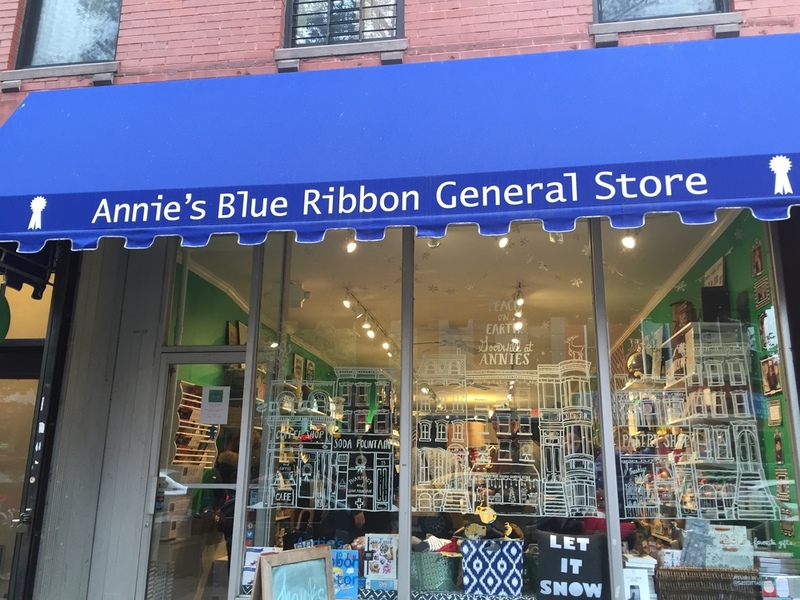 If you are in Park Slope, hit up Annie's Blue Ribbon General Store. It's the perfect place to pick up some unique decorations or gifts for everyone from your rabbi to your ex-husband's goddaughter (and more usual relations as well). And if you're neither a Brooklynite, nor Brooklyn bound, check Annie's out on Facebook, Twitter, Instagram, and Pinterest and let me know what you think!